An 18-year-old art student in Jerusalem discovered the hard way this month that Israeli prime minister Benjamin Netanyahu doesn’t care for irony. For a class assignment, she took the famous Barack Obama “Hope” poster and changed the face to Mr Netanyahu’s, next to a noose, with the word “Rope” replacing “Hope”. The student wanted to portray the prime minister as a hangman, who extinguishes hope of peace with incitement and political repression. The Israeli police and Mr Netanyahu, however, viewed the work not as a critique of incitement but as an example of it – with the noose intended for the prime minister. The student is now the subject of a well-publicised investigation. As with most art, context is everything. For Israelis on the left, as well as Israel’s minority of Palestinian citizens, Mr Netanyahu is considered the king of incitement. And in recent weeks he has lived up to his reputation. The background to the hangman image is Mr Netanyahu’s incitement against former prime minister Yitzhak Rabin in the mid-1990s, as the latter tried to drum up support for the Oslo Accords. Footage of the period shows Mr Netanyahu addressing crowds holding aloft placards of Rabin in Nazi uniform. Months later a right-wing activist shot Rabin dead in the centre of Tel Aviv. Mr Netanyahu’s current conduct has revived those memories, leading another former prime minister, Ehud Barak, to label him Israel’s “inciter-in-chief”. Heading the list of targets has been the fifth of Israel’s population who are Palestinian. Mr Netanyahu lost no time in blaming them for the forest fires that raged across Israel last month. He and other ministers referred to an “arson intifada” and “pyro-terrorism”, though experts attributed the blazes to months of drought, high winds and a lack of preparedness. Weeks later, no one has been charged with politically motivated arson. 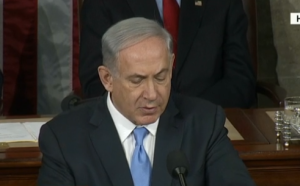 Nonetheless, Mr Netanyahu has not retracted his incendiary finger-pointing. In the parliament, the prime minister has led a boycott of the Joint List, a coalition of Palestinian parties, after they refused to attend the funeral of former president Shimon Peres. Faced with a court ruling to dismantle a tiny settlement outpost in the West Bank, Mr Netanyahu has announced a campaign of demolitions in Israel of homes belonging to Palestinians. He has accused the minority of rampant illegal building, glossing over the fact their communities have been denied master plans authorising construction. And David Bitan, chairman of Mr Netanyahu’s Likud party, declared last month his hope that Palestinian citizens “won’t come to the polls at all” at the next election. He was expanding on the prime minister’s notorious election-eve warning last year that the minority was “coming out in droves” to vote. Notably, Mr Netanyahu has not rebuked Mr Bitan. There is little doubt that such statements are influencing public opinion. A survey this month showed that just over half of Israeli Jews want Palestinian citizens stripped of the vote for questioning whether Israel can be both Jewish and democratic. A higher number, 59 per cent, object to Palestinian parties being included in the government. Aside from rebel art students and Palestinian minority leaders, only a handful of institutions continue to criticise the government, even if meekly. They are in Mr Netanyahu’s sights too. The government is threatening to overhaul the supreme court to rid it of “liberal” judges, and has conditioned arts funding on theatres touring the settlements. The Haaretz newspaper is, according to Mr Netanyahu’s office, peddling “Nazi propaganda”, while the broadcasting authority has been “captured by leftists”. On Sunday, the government approved a “Facebook bill” to block any online content it deems incitement. Presumably Mr Netanyahu will be immune. Another bill disqualifies Israeli human rights groups from eligibility for national service volunteers, after an earlier law suggested they are traitors for receiving overseas funding. The education ministry has introduced new rules to deter schools from inviting speakers from human rights organisations. And an “ethics code” is being devised to police the political discourse of higher education staff. All of this is designed to taint left-wing speech and activity as “treasonous”. The Israeli public has received the message loud and clear. The same poll this month found 71 per cent of Israeli Jews believe human rights groups harm Israel, while half consider those identifying with the left as a fifth column. Perhaps none of this should surprise when Mr Netanyahu rushed to incite against the United Nations last week after the Security Council upheld international law, passing a resolution against Israel’s settlements. He described the resolution as “contemptible” and “anti-Israel”, and claimed President Obama had stabbed Israel in the back. In similar vein on Monday, Mr Netanyahu’s defence minister accused France of anti-semitism and putting Israel on trial after it announced a summit next month to revive peace talks. Mr Netanyahu is drawing his noose wide, not only for recalcitrant Israelis but for all those who stand in the way of his Greater Israel.